The Alesis Q88 works with virtually any music software and MIDI hardware devices. Providing the full piano complement of 88 keys, the Q88 is a sleek and portable controller, at home on stage or in the studio. A full array of essential controls is onboard, including pitch and modulation wheels, octave up and down buttons, and an assignable data slider. The Q88 is the perfect choice for controlling hardware MIDI devices. Compact and portable, the Q88 is the ideal foundation for your road ready rig. The Q88 offers a streamlined layout to maximize your sound and performance options. You can even send Program Changes from the Q88's keys to change programs, patches, and more. The Q88 comes with Ableton Live Lite Alesis Edition software so you can perform record and sequence music right out of the box. This customized version of Ableton Live provides a fresh and easy way to create music. You'll get audio recording and production capabilities as well as powerful tools for live performance. Ignite provides a refreshingly original and musician-centric way to quickly capture, combine, and arrange your musical ideas. The intuitive graphic interface encourages you to experiment and explore. Smart MIDI Chord and Phrase Players empower your ideas and bring them to life through over 275 superior instruments sounds created by AIR Music Technology. When you're ready to collaborate with other musicians or take your ideas to the next level, you can share them through SoundCloud, or export your WAV and MIDI files and import them into Pro Tools-or any DAW software. 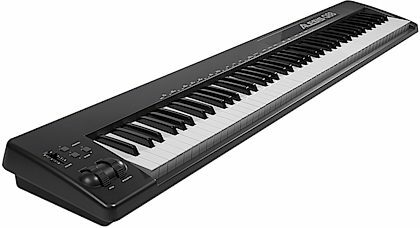 Best of all, Ignite offers seamless integration with your Alesis keyboard controller, with no set-up chores to perform. zZounds is an authorized dealer of Alesis products. "Connect to having just the right touch with your music"
Overall: I had previously used my Yamaha P35 electric keyboard to connect with PreSonus Studio One 3. It had not released the notes like expected. As soon as I hooked this up to my system, which now also has Ableton Live 9 Intro, I had no contradictions with the attack and release that I had expected with my music. The modulation wheel allows me to shape the sound if needed so it's just right.